Ever since Marvel starting setting up The Avengers team up film with the character's solo films I knew I'd be going to see it. From the moment I saw the first Avengers trailer, there was no doubt I'd be seeing it in the cinema rather than waiting for DVD. I was mostly going to see Robert Downey Jr. play Ironman again. He's just pure entertainment as Ironman and Tony Stark. Even though Ironman 2 was largely unnecessary, as a film leading up to the Avengers, it was still great to see Robert play Ironman in it. I thought all of the solo films were pretty good. You can read my thoughts on Captain America and Thor's movies before continuing if you like. I never reviewed Ironman's two movies (though I own them both). I have seen and enjoyed both of the Hulk movies - however only the second one really has some relevance to the Avengers film. As it turns out, the two movies you really should see before Avengers is Captain America and Thor, as both contain important elements that carry through into the team up film. It's not critical to have seen them but, as I thought, it does add a little more to the film if you know some of the history from those two films. My partner and I went to see The Avengers in 3D. The film had such good word of mouth I figured it was worth spending the extra money for such an event. It was nice to experience the film in 3D but, by about 30 minutes in, I couldn't have cared less about 3D. I was so into the film that I stopped noticing the 3D effect in favor of just enjoying the movie. If you want a synopsis of the film or a proper review then visit the movie's page on the Internet Movie Data Base site. As usual the rest of this post is just my thoughts and reactions to the movie. If you haven't seen it then beware, there could be spoilers from here on in. All you really need to know going in is that this is a team up movie of what are now Marvel's biggest names in Superheroes. If you like Superheroes fighting Superheroes and Superheroes fighting villains, funny dialogue and big action, this movie delivers and then some. It's the kind of film where none of the characters really dominated the screen but you'll leave thinking your favorites stole the show. Every single member of the Avengers gets several great opportunities to shine through the course of the film and none of them seem wasted, underused or unnecessary to the story. Quite seriously, I nearly teared up for Hulk. After two movies that didn't quite hit their marks in capturing what's cool about Hulk, this movie is hands down the best on screen Hulk (and Bruce Banner for that matter) I've ever seen. Mark Ruffalo succeeds in getting you invested in Dr Banner and convincing you that Bruce is still a big part of the Hulk too - even though he talks about Hulk as 'the other guy'. Mainly though, this movie has fun with Hulk. He's dangerous, he's awesome in a fight and he provides some of the best laughs of the film. I don't remember laughing at all watching Hulk's solo films. In the way Batman fans say Chris Nolan's batman is 'my Batman' I'd say Joss Whedon's Hulk is 'my Hulk'. Sure it's more of the same from Robert Downey Jr. but that's what I was hoping for. However what's new is how Tony Stark's personality clashes and blends with the other Avengers. On the surface he gets to show all the wit Stark's known for but on a deeper level, his connection with Dr Banner is one of the most interesting relationships in the film. I'd be very happy to see Bruce Banner show up in a future Ironman film to develop that more. People say Black Widow's presence in Ironman 2 was a waste of time. I can see why as, for the most part, she sets up some really great jokes but doesn't do much critical to the script. Though it was still nice to see her in the film. In Avengers Scarlett Johansson gets to really contribute some awesome scenes and to demonstrate why she's earned a spot in the team. I didn't think Captain America really got a chance to shine in his own movie as much as I would have hoped. What's good about his journey in this film is how he grows into the leadership role with the other members rather than just being accepted as the leader right from the get go. He also gets to have some better fight scenes in this than in his own movie. His new suit needs work though - little too comic book still. Chris Hemsworth pretty much continues his role as Thor without missing a beat from his own film. Chris is great as Thor but it's his interactions with Hulk that really stands out. I wasn't sure about having Loki as the villain going into the movie but the premise does work and makes sense with Loki's motivations in Thor's movie. I do question how both Loki and Thor get back to Earth since they destroyed their gateway in Thor's movie. Loki came through from the cube being powered up but he had to have some way to at least watch what was happening on Earth prior to that because he arrived, all ready to put his plan into action. ...and Thor just arrives. Guess they must have fixed the gateway from Asgard by then? My only let down of the film is that Loki's army appears to be a surplus army from the Star Wars franchise. That is, it's an army controlled by a central power/control source. You take out the control source and all the soldiers and weapons cease to work and drop to the ground. Like the clone armies of Star Wars. It makes for a convenient way to stop a war but real wars rarely end like that and, you'd think a race with such advanced technology, could make an autonomously controlled soldier. The enemy having their 'off switch' flipped was the only moment that took me out of the film. The rest of the time I bought into the whole thing and really enjoyed the ride. 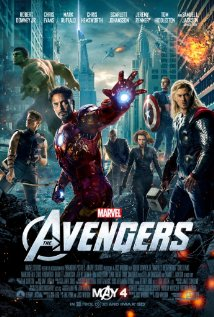 The Avengers is easily my favorite Superhero film of all time at this point for sheer entertainment value. If Marvel can maintain the quality of their Superhero solo films, I'll be sure to watch them in anticipation of Avengers 2 - which, with the box office takings of this movie, is virtually guaranteed. I've just realised that this isn't the remake movie version of the series 'The Avengers' with Patrick McNee as John Steed etc, which is what I thought it was by the title, not having looked at any video of it? Don't know if it will be for me, though I did used to enjoy the series back in the 60s in UK. It was quite a new thing for its time. This movie is called 'Avengers Assemble' in the U.K. to avoid that very confusion. Did you see the 1998 movie version based on the 60's U.K. series 'The Avengers' staring Uma Thurman as Emma Peel? No, I didn't. Was that on at the cinema? I think I vaguely remember something about it being out. Probably didn't appeal at the time, as they're not usually as good as the original. Did you know that Joanna Lumley played one of the main ladies parts in the UK series? A much younger version of course, though she doesn't look bad now. She had her hair in a blonde page boy. I remember she was ontop of a car when it went through a car wash, and she dried all her clothes and hair like a hair dryer and came out looking the same at other end! I forget what name she was using then. I thought she looked familiar when Ab Fab first came out, then I realised who she was, because I'd never taken notice of her real name in the credits. Why Would You Donate to My Frog Van Fund? Forget Self Driving - Where's My Flying Car! !